A mining company in North-West Australia required five separate solar lighting kits for several sheds and shipping containers used as store rooms. The lighting had to comply with Australian recommendations for minimum safe lighting levels which stipulates a minimum light level of not less than 40 Lux. 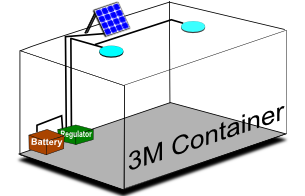 They required lighting for 2 hours per day with autonomy for 3 days, so the batteries had to provide enough capacity for 4 days without solar recharging while not going below a DOD (depth of discharge) of 50%. The solar panels had to provide 150% of daily power consumption every day to make up from 50% DOD to fully charged in 5 days of full sunlight (5 x 4 hours equivalent peak sunshine). To provide this we calculated that each 4 meter square area had to be illuminated by at least 160 lumen. This meant that each light fixture be spaced 2 meters apart. 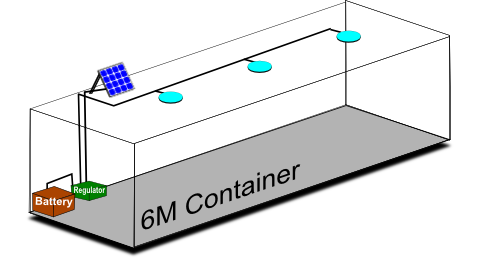 The largest lighting system was needed to light up two 12 meter shipping containers with a covered are of roughly 20 square meters connecting the two. The other lighting kits were for a 4x5 meter shed, and three separate containers of various lengths. one 12 meter container, a 6 meter container and a 3 meter one. Lighting consists of three 4 watt LED dome lights per container and two18 watt LED flood lights for the loading area. Lighting consists of six 4 watt LED dome lights. Lighting consists of three 4 watt LED dome lights. Lighting consists of two 4 watt LED dome lights. Lighting consists of four 4 watt LED dome lights.